A shoulder problem or injury can affect your ability to use your arm as you normally would, which can interfere with your normal daily life. Made of three joints which allow a great range of motion, shoulder problems can arise at any age. Due to overuse, strains and injuries, a shoulder problem can leave patients with stiffness, loss of motion, severe pain and even arthritis. 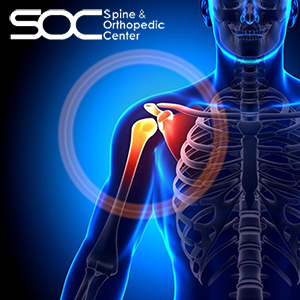 If you are suffering from a shoulder condition or injury, and you don’t find relief from over-the-counter anti-inflammatory drugs or rest, our team of specialists at Spine & Orthopedic Center offer both non-surgical and surgical shoulder treatment options for patients in all our offices in Broward and Palm Beach County. Call us at 888-409-8006 for inquiries. A severe injury – falling, sports-related or car accident – can cause a rotator cuff tear. Another common cause of rotator cuff tears is a prolonged breakdown or degeneration of the associated tendon. Common symptoms include night pain, weakness, pain during activity, and radiating pain from your shoulder down your arm. If diagnosed early on, rotator cuff tears can be treated with activity modifications, light therapy, and in some cases, a cortisone injection. If the tear doesn’t respond to non-operative treatment, a rotator cuff tear surgery may be considered. Unfortunately, shoulder and clavicle fractures are very common. And while many fractures of the shoulder can be treated without surgery, some severe fractures often require surgery. The most common cause of shoulder fractures is a fall. The bursa is a small fluid-filled sac between the rotator cuff and acromion. Bursitis occurs when the bursa might suffer inflammation which can be very painful. This bursa inflammation is commonly caused by overuse activities which cause friction and scraping of the rotator cuff and its nearby joints. Why Does My Back Crack?